Good with kids: No, kids should be 15 years old and older. She startles easily and doesn't like commotion. She can handle being around children for a short amount of time, but gets annoyed very quickly because of the excitement and commotion. 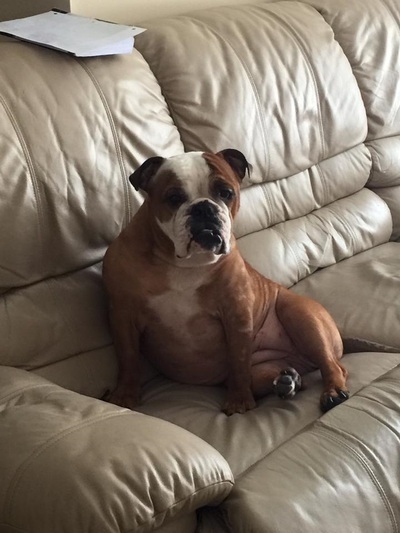 Please consider sponsoring Penny to help with her medical bills. Full bio: Please meet Penny! 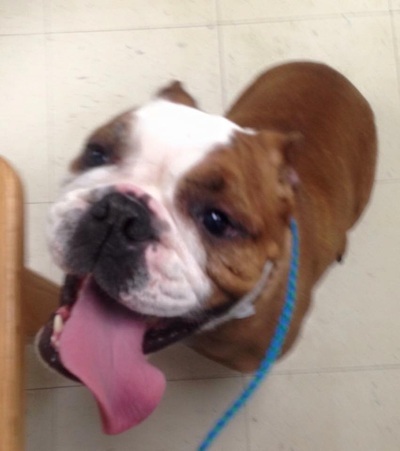 She is a 53 pound red English bulldog with white markings on her face and neck, and is estimated to be 4 years old. Penny came to us after her owner contacted us to surrender her for fighting with the other dog in the home, but … Due to lack of fosters we were unable to accommodate her soon enough, so she was taken to the shelter. We picked her up and were able to get her into a foster home with no other dogs. We took care of all her medical needs – including a tail amputation – and she is now ready to find her furever home. Penny is looking for a loving home where she can cuddle her humans, and sleep with them in bed/on their furniture. Napping is her favorite activity, and is what she spends a lot of her day doing. Penny is really low energy and likes to go on the occasional 15 minute walk, but she does not like commotion, other dogs, or children. She is a wonderful companion and is willing to give endless amounts of love and attention, but she needs to be assured that she is the only pup in your life. Penny loves to meet kids and have them pet her, but only for a little bit - she gets frustrated with the commotion and needs to go back to a calm environment where she can sleep some more. Because she doesn’t like too much commotion, she would really do best if kids in the home were 15 years old and older. Penny requires a great amount of love, attention, and affection, but rest assured that these will be fully reciprocated. Penny knows to go to the door to potty and is fully house trained, as well as crate trained (although she thinks that going to her crate is a punishment, so she should only be put in there when you aren't home). Penny requires no special medical attention, but she does need a specific kind of food due to allergies to grain and poultry. She LOVES car rides, and will lay in the back seat and sleep for hours without making a peep. She doesn't like toys much since she is missing a few teeth, and the ones she has aren't in the best shape. Penny really just needs some parents who can spend as much time cuddling her as possible while making sure she gets all of their attention. Penny will need a home with no other dogs, and we don't she will do well with cats. She is neutered, up to date on shots, and housetrained. 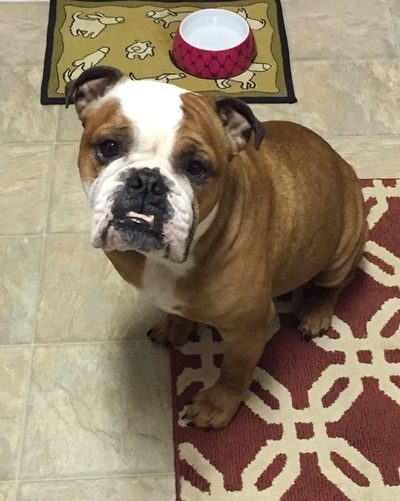 Please consider opening up your heart and giving Penny her loving furever home! April 7 update: Penny is recovered and healing very well from her recent tail removal. She is doing so well after her surgery, and her demeanor has totally changed. It is easy to tell the difference the tail pocket infection made in her personality and comfort level. She is still lazy as always and sleeps all the time, but she has been enjoying walks at night when the weather is nice. She still doesn't like to go outside and "play" - the only time she really wants to go is when she realizes we are going on a walk or needs to go to the bathroom. She is fully house and crate trained, but she seems to think that being put in her crate is a punishment, so we try to keep that to only when we aren't home. Penny loves to cuddle her humans, so she should be somewhere that she is allowed to sleep in the bed as well as lay on the furniture. Honestly, she is just a loving and low-energy cuddle bug who needs a calm child-free and dog-free home. 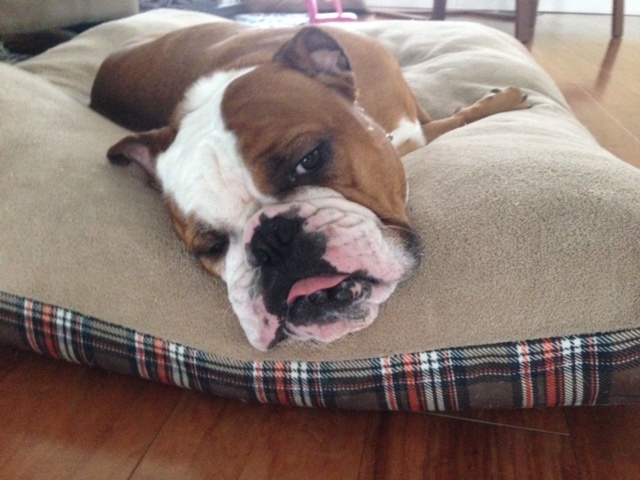 March 8 update: Penny has been doing great in her foster home the past few weeks. We have had some minor setbacks with paw licking to the point of it bleeding when we aren't home to monitor, and her skin seems to be extremely itchy lately (especially her neck). All In all her skin looks great and the wounds from her staph are healing quite well. She is a huge sweetheart and just wants to be loved all the time. When we are home she never leaves our sides. She still has a very hard time with other dogs and her extreme excitement when she sees new people can sometimes be borderline aggressive. This has been intimidating to my nephews and cousins we introduced her to. We are working with her, but it doesn't seem like it's something we can really stop her from doing - so we don't think she should be in a home with any small children. Other than that, she is the sweetest and most loving dog. We have talked a lot about her personality and we both agree that she just desperately wants love and affection from her humans. Whoever is lucky enough to adopt Penny is in for an endless amount of love, kisses, and bully cuddles. February updates: Penny seems to be settling into her foster home quite nicely! 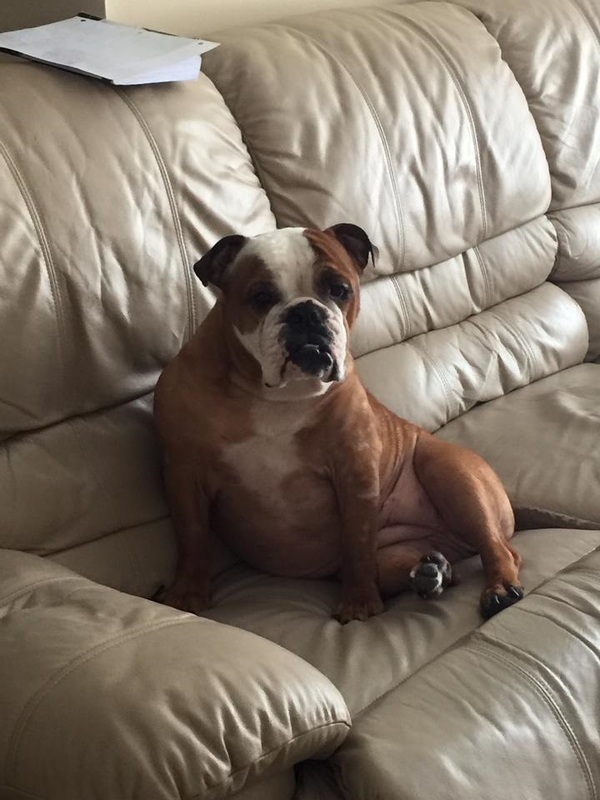 She wasn't getting along with the dogs in her previous home, so she is enjoying her time in a dog-free home. She really loves to nap - it's her favorite pastime :) Her foster has noticed Penny's tail seems to be bugging her quite a bit. Upon further evaluation, she was found to have a pretty inverted tail that will need to be removed. She will be having that done soon. Intake info: Penny's original owner had contacted us to take Penny due to fighting with another dog in the home. Due to lack of fosters we were unable to accommodate her soon enough so she was taken to the shelter. We picked her up and have her at the vet where she's being treated for a minor staph infection. Overall, she appears to be in good health with minor stenotic nares and she could afford to gain a few pounds. She'll be placed in a foster home and once we know more about her we will update more.